Translation Services 24 are a fully accredited UK based translation agency offering competitively priced legally certified translations in over 200 languages to a variety of clients - from private clients, SMEs to large, multilingual organisations. Here, at TS24, we fully understand the importance of legally authorised translations and consequently provide official translations to our clients based both in the United Kingdom and abroad. Our certified translations follow official guidelines and are recognised and accepted by government bodies such as the Home Office, Courts of Law, Educational Organisations and other such official institutions. If you'd like an official quote for translating and certifying your documents, simply send a scanned copy (or a good quality picture) of your documents to info@translationservices24.com or use one of the contact forms available on the website, and we will get back to you with an accurate price quote shortly. Our standard certified translation is an appropriate solution in most cases. Nevertheless, there are different categories of certified translations that might be required for specific purposes. Our standard translation service and certification includes a certified letter signed on headed paper. By doing this, we declare that your documents were translated from an original document (or from a copy of the original) and that the text translated is accurate and complete. This certifited translation is recognised by all UK offices including the Home Office, Passport Offices or courts of law. A notarised translation is usually requested by Government agencies and legal bodies. This process involves a Translation Services 24 representative attending an office of notary to sign and stamp the document. The original document is required for this level of certification. The purpose of an Apostille certified translation is if the document needs to be presented overseas (outside the UK). The process is the same as a notarised translation with an additional step of sending the document to the Foreign and Commonwealth Office for authentication. This translation is suitable for all countries abiding to the Hague Convention. 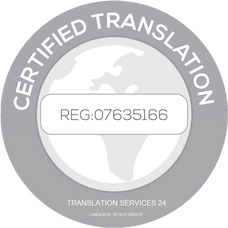 What is a 'Certified Translation'? An officially certified translation is the translation of documents such as certificates, patent documentation, contracts etc. which for legal reasons must be accurately translated and accompanied by a signed statement of truth from an accredited translation agency, such as ours. Officially translated documents, which are certified are legally recognised and commonly accepted by government and other official bodies in the United Kingdom and abroad. As every translation project is different and intends to serve a different purpose, it is important to be aware that depending on circumstances, a different type or level of certified translations may be required. Here, at TS24, we not only accurately translate and officially certify your documents, but we also appreciate that time can be an important factor and if required, we can provide this service at a very short notice. Official documentation and material often require an officially recognised stamp, affirming both the competence of the translator and the accuracy of the translation. This is where certified translation becomes relevant. 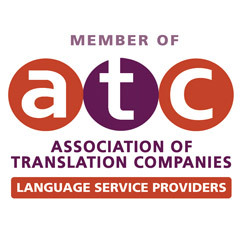 As our translation agency is a registered member of the ATC (Association of translation companies), we are authorised to provide certified translation services which are legally recognised around the world. How to certify your translation? Getting your documents translated and officially certified is easy with us. To go ahead, you can simply email a scan copy (or even a good quality picture) of your documents over to us and we will issue an official quote for the certified translation within just 30 minutes. Alternatively, you can also use one of the contact forms on our website to attach your documents. How long does it take to certify a translations? In general, for documents which are below 2,500 words, for example different types of certificates, it should take around 1 working day to translate and certify your document. For larger documents, we are able to accurately translate and officially certify up to 2,500 words within 24 hours. For more urgent projects, we are able to offer our fastest translation service which can cover the translation and certification of up to 10,000 within 1 working day. Over the years, we have established our position as one of the leading providers of officially certified translations by working with a variety of clients - from private customers to UK based SMEs as well as large, multinational organisations operating globally. Our certified translation services are accepted by all UK authorities including including the Home Office, Courts of Law, General Medical Council, NARIC, insurance agencies, educational institutions, clubs and other such authorities. We've been working with TS24 for over 2 years now whenever our company requires an officially certified translation of documents. The levels of professionalism and customer service are by far the best we've encountered in the industry. TS24 is always our go to agency for language translations and interpreting. We find them very professional, hands on and flexible with the way they offer their services. We are an officially accredited translation company and can therefore provide you with an official and legally recognised certificate of authenticity, issued and signed on our letterhead paper, along with a hard copy of the official document and the translation. Our certified translations are accepted by UK authorities and majority of organisations abroad. In order to keep our translations to a high accuracy and professional standards, we only work with most experienced and talented translators who are not only native speakers of the target language, but also have a first-hand experience within the field of interest, whether it's legal, medical or marketing sector. Our London based translation agency specialises in providing official translation services, which you may require when presenting legal documents to the government bodies, such as the Home Office, Courts of Law or educational institutions. All of our translations are accompanied with a legal stamp confirming accuracy of the translation and are therefore accepted worldwide. To ensure the highest standards of accuracy and reliability of our certified translation services, all of our linguists are not only native speakers of your target language, but are also official members of the Institute of Translation and Interpreting﻿ (ITI) and/or Chartered Institute of Linguists (CIOL), which allows us to provide different types of certification of your translated documents. 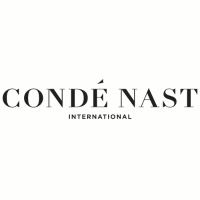 Do I need a certification translation? There is a number of different reasons why you might need your translation officially certified. Generally speaking, any document that needs to be translated and will be used for legal purposes, such as birth, marriage certificates or documents intended for official use, such as contracts or patents will have to be certified. Our standard certified translation service is fully compliant in the UK and includes a declaration confirming our details as an agency responsible for the translation, the company's accreditation to translate & certify, that it is an accurate and professional translation of the original document and our London translations office's contact details. It is also dated and includes the original signature of our account manager responsible for handling your project. Who Can certify my translation? Very often people believe that just because they are able to speak two languages fluently, they will be able to translate the document themselves, certify it and then present it to the authorities. Unfortunately this isn't the case and in order to ensure that your documents are legally recognised by authorities, they will need to be translated and certified by an officially registered translator and a translation agency which is a member of the ATC (Association of Translation Companies), just like we are. The time needed to complete the process of translation and certification of your documents depends on a number of factors, such as word count or target language. Nevertheless, in most cases we are able to complete the entire process within just 24 hours. In cases where larger documents are required to be translated, a deadline will be agreed with you before we start the project. Translation Services 24 is an accredited translation company and after the translation is completed, we can therefore provide you with a certificate of authenticity, issued and signed on our letterhead paper, along with a hard copy of the official document and the translation.